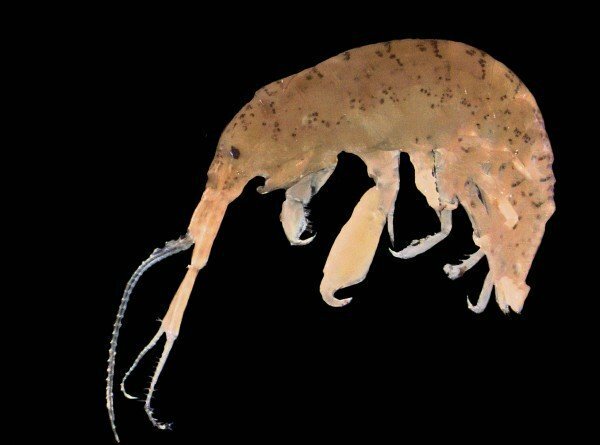 A common marine crustacean has shown researchers that it’s all set to beat climate change – the males will get more attractive to the females, with a resulting population explosion. Male Cymadusa pemptos, showing the claw which is bigger under future climate conditions. “Climate change most usually comes with predictions of severe negative impacts on population sizes, if not extinctions,” says Dr Munguia, in the University’s Environment Institute. “In general, booming populations are not predicted. “It got even more interesting, however, when we dug deeper and found that males were much larger in size than in previous generations under cooler waters and lower CO2, and their bigger claws were disproportionately larger still. Females stayed the same size. “On top of that, where there had been variation in large claw size throughout the population, suddenly all the males had large claws. This happened within a few generations. “We know that climate change will be cataclysmic for many species but in some cases it will not,” says Dr Munguia. “This is the first quantitative example of how it will be beneficial for some individual species, albeit with massive consequences to the environment overall. Web Source: University of Adelaide.